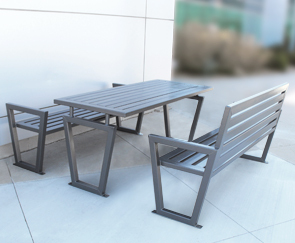 The striking sleek design of the 'Decora Style' picnic bench table creates that clean contemporary modern appeal of current architectural styles. 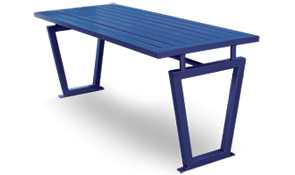 Balance of form and function, this rectangular table and benches are soundly constructed. 3" x 1-1/2" - 1/8" Thick Steel Slats. 2"Sq. - 1/8" Thick Steel Tube Frame.